Leslie Lang Daniels was born in Mobile, Alabama on December 18, 1949 to Raleigh Daniels Sr. and Oralie Lang-Allen; both preceded him in death. Leslie was the sixth child born to this union. As a young boy, he attended Most Pure Heart of Mary Catholic School and served as an altar boy for Most Pure Heart of Mary Catholic Church. At the age of twelve, he relocated with his mother and siblings to Los Angeles, CA. From day one, Leslie never met a stranger and was a friend to all. He especially shared a deep and loving bond with each of his brothers and sisters until his untimely death. Leslie was definitely the life of his family; with the biggest heart and gleaming “potato chip” green eyes. Leslie attended Mount Vernon Jr. High School and graduated from Dorsey Senior High School where he was a star basketball player. His love for basketball would follow him when he joined the U.S. Army in 1967. Serving in Van Berg, Germany during the Vietnam War; Leslie not only served his country, he served opponents on the court. He was “Spud Web” before there was a “Spud Web”. In 1970, he returned home to his family an honorably discharged Veteran. Upon his return to the States, Leslie became a work source recruiter for Opportunities Industrialization Center (OIC). As a recruiter, he assisted individuals with acquiring the necessary work ethics and skills needed to gain employment. It was during this time, he met a beautiful woman who caught his eye and ultimately, his heart. Leslie was a very confident, strong and intelligent man. He loved helping others and had a gift of making people laugh. He was a great cook and had a way about himself that made everyone he encountered feel special. It was these qualities and more that would capture Rhoda Cole’s attention. Leslie courted Rhoda and they were married in a beautiful garden ceremony at Yamashiro Restaurant in 1978. To this union, two daughters were born, Kellie Cole Daniels and his namesake, Leslie Lang Daniels. He was an awesome stepfather to Richard “Richie” Norris and raised him as his own son. Leslie adored his children and grandchildren endlessly and forever professed his undying love for them. Leslie continued his passion for serving by working almost a decade for the U.S. Post Office as a Postman. He would later work for BNS Technical Institute as their Director until he retired. 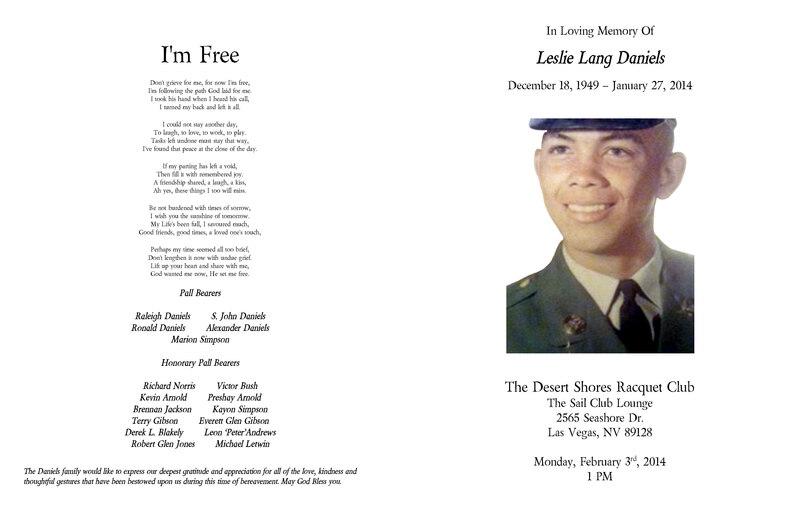 Upon retiring, Leslie relocated to Las Vegas, NV where he remained until his passing on January 27, 2014. In usual Leslie fashion, he became very popular at The Manor, the senior housing community where he resided. True to his ability to unify and bring neighbors together to have a good time, Leslie was affectionately named, “The Mayor of The Manor”… A position he took seriously. There are many great things that can be said about Leslie but what he will most be remembered for was his love for his family and friends. He was a sports fanatic, a huge jokester and had a nickname for everyone. He absolutely loved the Dodgers and the Lakers. He had an unbreakable bond with Terry and Glen Gibson and the entire Gibson family. He was a loving father to his children, a best friend to his brothers and sisters; his nieces and nephews’ playmate and protector and lastly, Leslie always had a smile on his face no matter what obstacles life dealt. Leslie has undoubtedly left his family and friends with a void in their hearts; but a lifetime of memories and great laughs. Leslie leaves to mourn his memory: The love of his life, Rhoda Cole; daughters, Kellie C. Daniels (Victor) and Leslie L. Daniels. His step-son Richard Norris; grandchildren, Kedan, Layla, Xavier and Victoria. His siblings: Beryl Warren, Raleigh Daniels (Joann), Ronald Daniels (Norma), S. John Daniels (Vita), Alexander Daniels and Marian Allen. His nieces and nephews and a host of extended family and friends. Leslie “Slaus” Daniels was a revolutionary activist at the height of the Black Freedom Movement of the 1960s-1970s. Slaus became a political activist along with his older brother, John Imani Daniels. Starting in 1968-1969, as recalled by Lil Joe Johnson, Imani was a Black student leader at Los Angeles City College, working in alliance with the Black Panther Party and other grassroots activists, and “was among the first intellectually developed and openly Marxist theoretical as well as political leaders in the Black liberation movement in L.A.” As Lil Joe puts it, “We were deeply involved in practical politics from a revolutionary perspective, praxis!” In this he was also joined by joined his brothers Raleigh and Ronald in participation in the revolutionary movement. Meanwhile, while stationed in West Germany, Slaus helped organize GI protests against the Vietnam War and widespread racism in the military. In the early-mid Seventies, he joined Imani, Joe and others to organize the Socialist Collective, a South Central-based Marxist group. The SC and its predecessors organized grassroots campaigns around the war (1969-1973); LAPD brutality in the community during that time period, the American Indian Movement’s occupation of Wounded Knee (1973), the CIA-sponsored coup in Chile (1973), LAPD assassination of the Symbionese Liberation Army (1974), defense of the “Attica Brothers” (1974), solidarity with the Portuguese Revolution (1974) and numerous other issues of the time. Les was selected to be on the International Socialists “central committee” and moved briefly to the Midwest to fulfill that role. Many Thanx for this, Michael. It is deeply appreciated.